Can you believe Christmas Eve is only a few nights away! Actually I'm pretty relaxed at this point. All of my shopping and wrapping is complete - yay! 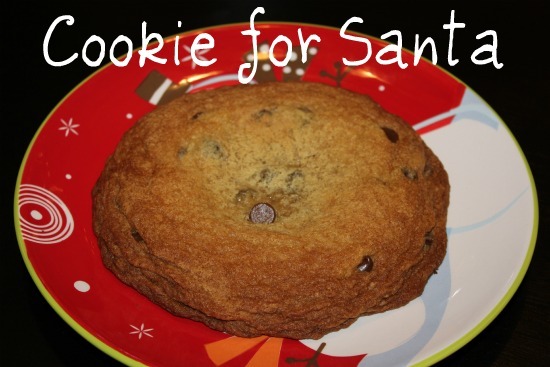 I thought tonight was the perfect night to try out Picky Palate's cookie for Santa recipe. This cookie was so quick to prepare that I'll be able to whip out another one for Santa in no time! This huge cookie is delish and you can make it using only one bowl! I did use my hand mixer, just because I was being a little lazy, but the recipe says a spoon will work out just fine. Place butter and sugars into a medium mixing bowl, beat with spoon until well combined. Add beaten egg and vanilla, mixing to combine. Add flour, baking soda and salt. Stir a couple times, then add chocolate chips, stirring to combine. Scoop dough into the middle of your prepared baking sheet. Bake for 12-15 minutes, until baked through. Let cool for on baking sheet for 10 minutes before removing. Place on a cute plate for Santa. Don't forget the glass of milk! love this idea to make ONE big cookie! Santa, must have been so delighted to get such a wonderful cookie.